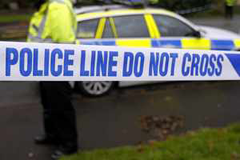 A man has been arrested after two men, believed to be in their 20s, suffered stab wounds. West Midlands Police said they stopped a speeding vehicle in Birmingham which was said to be on its way to hospital. A spokesperson said an injured man was found in the car. A second man with stab wounds subsequently attended the Accident and Emergency department. Part of Coventry Road in Digbeth has been cordoned off as police continue their investigations.